AMHERST, N.Y. – Daemen College will honor six accomplished graduates at its 2018 Distinguished Alumni Awards dinner scheduled for Oct. 26 in the college’s Wick Campus Center Social Room. The Distinguished Alumni Awards recognize the achievements, growth, and societal contributions of the college’s outstanding alumni. 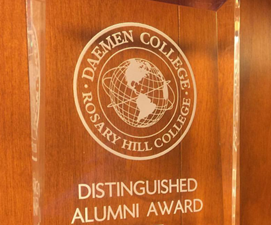 Award recipients exhibit the ideals expressed by the Sisters of St. Francis of Penance and Christian Charity when they founded Rosary Hill College and that remain strong at the institution known today as Daemen College. Dr. Adair White-Johnson ’86 will receive the Distinguished Alumna Award, the highest honor presented to a graduate. The award recognizes a graduate who has achieved distinction in their career and in the community and has shown outstanding dedication to the college. Other 2018 Distinguished Alumni Awards will be presented to MaryEllen Swartzenberg Elia ’70, Advancement in Career; Rafael Genao ‘02, Dedication to the College; Carmen Ramos Rodriguez ’71 (posthumously) and Dr. Margaret Sullivan Hopson, ‘82, Service to the Community; and Annie B. Stoll ’08, Graduate of the Last Decade. The Distinguished Alumni Awards dinner is being hosted by the Daemen Office of Alumni Relations and the National Alumni Board of Governors, which selects the award recipients. The event will begin with cocktails at 6 p.m. and followed by dinner at 7 p.m.
Tickets may be purchased from the alumni relations office at alumni@daemen.edu or call 839-8364. White-Johnson is a best-selling author and leading authority on motivating and inspiring others to make positive changes in their lives to overcome life’s challenges. She has authored several books that offer inspirational messages, strategies, and techniques that empower individuals to become change agents in their lives. White-Johnson received a bachelor’s degree in psychology from Daemen, and a master’s degree in counselor education/school counseling and guidance services and a doctorate in education from the University at Buffalo. After retiring from a successful career as a professional school counselor, White-Johnson created The Empowerment House, where she coaches teens and women to become more resilient through life changes. In addition, she developed an empowerment and resiliency curriculum for teens, which won the Writer’s Award for Excellence, the highest honor in writing from the Georgia School Counselor Association. White-Johnson, recipient of the 2018 Daemen HEOP Distinguished Alumna Award, serves on the University at Buffalo Alumni Association Board of Directors, and has previously served on the executive board of the Cobb County School Counselor’s Association. She was also the 2012 “Face of Lupus” for the Georgia Chapter of the Lupus Foundation of America. She resides in Powder Springs, Ga.
Elia serves as the New York State education commissioner and president of the University of the State of New York (USNY). Appointed in 2015, she is the first woman to hold the post. In this role, Elia oversees the work of more than 700 school districts with 3.2 million students, 7,000 libraries, 900 museums, and 52 professions encompassing more than 850,000 licensees. Prior to her appointment as commissioner, Elia served for 10 years as superintendent of schools in Hillsborough County, Fla. In 2015, she was named the Florida Superintendent of the Year and was a finalist for the national award, and she received the AASA Women in School Leadership Award from the School Superintendents Association. Elia, who has 45 years of experience as an educator, was a social studies teacher at Sweet Home High School for 16 years and then moved to Florida, where she was a reading teacher in the Hillsborough County School District. She then held various administrative roles in the district. Elia graduated from high school in Lewiston and went on to earn a bachelor’s degree in history from Daemen, and a master’s degree in education and a master of professional studies, both from UB. A native Western New Yorker, she resides in Albany. Genao, who received a bachelor’s degree in humanities from Daemen, co-founded the college’s Students Without Borders (SWOB) organization, which participates in humanitarian medical missions. Since SWOB was founded at Daemen, medical care and clothing donations have been provided to nearly 8,000 residents from the remote village of Prograso Dos and surrounding communities. For nearly 20 years, Genao has joined physician assistant and physical therapy students on SWOB humanitarian medical missions organized by Daemen, Clarkson University, and Lynchburg College. He raises support for the trips through walk-a-thons and other activities. In 2014, Genao founded the MEND Global Foundation and is working to increase the frequency and reach of medical missions to other Caribbean/Latin American countries. He resides in Boston, Mass. Rodriguez was born in the sugar mill town of Aguirre, Puerto Rico. In 1953, she came to Buffalo with her husband Faustino Rodriguez-Trias. A strong believer in education, she received a bachelor’s degree in Spanish from Rosary Hill College and a master’s degree in education from UB, all while raising her family. Rodriguez was active in the Puerto Rican communities in Buffalo and Hartford, Conn. In Buffalo, she was a member of the Puerto Rican Center and in 1972 was named administrator of bilingual education at Public School 76 (Herman Badillo Bilingual Academy). Rodriguez moved to Hartford in 1979 to work at the Hartford Area Manpower Consortium. She then worked for the Harford Housing Authority from 1981 until she retired in 1996. During her years in Hartford, Rodriguez was also executive director of La Casa de Puerto Rico and was a member and served as president of the Hartford Board of Education. Rodriguez passed away in Hartford on her 83rd birthday on Jan. 22, 2018. She is survived by seven children, 15 grandchildren, and nine great grandchildren. Originally from Upstate New York, Hopson graduated from Daemen with a bachelor’s degree in physical therapy. She began her career in Palm Springs, Calif., where she gained experience in acute rehabilitation of patients with head and spinal cord injuries as well as outpatient orthopedics. Hopson continued her education at Northern Arizona University and went on to earn a master’s degree in biomechanics and a doctor of physical therapy. An orthopedic clinical specialist, Hopson owns High Desert Physical Therapy in Winslow, Ariz., an outpatient orthopedic physical therapy practice. She devotes her life’s work to the community of Winslow, a small town with an aging population. Hopson completed 200 hours of training in integrated yoga therapy and has since been involved in using this yoga program with Western medicine. She is a resident of Flagstaff, Ariz. Her son, Chadwick Hopson ’10, is also a Daemen graduate. Stoll, who received the 2008 President’s Award at commencement, earned a dual bachelor’s degree in illustration and graphic design from Daemen. After graduating, she accepted a position at White Bicycle Design Studio, where she worked on many Gold and Silver Addy award-winning projects. Stoll was nominated for a 2014 Grammy in the best recording package category for her design work on the Automatic Music Can Be Fun album. At the time of her nomination, she was the youngest graphic designer in more than 20 years to be nominated for the award. Stoll is art director at SONY Music Entertainment/Arcade Creative. Her design talents may be seen on a wide range of CD and music packaging she has worked on for groups and artists at SONY such as Pentatonix, David Gilmour, Superfruit, Lo Moon, Barbra Streisand, Adele, and Pearl Jam, among many others. Stoll’s creative talents may also be seen on “Weird Al” Yankovic’s box set called “Squeeze Box,” and she has recently completed an anthology, “1001 Knights,” a three-volume set of books featuring the creative work and talent of more than 260 artists.